This rustic version of ragù calls for several different kinds of meat, each contributing a different dimension to the sauce, but it's the chicken livers in particular that lend a gamy depth. In a small saucepan, bring broth to a simmer over medium heat. Put tomato paste into a small bowl and pour in 1 cup broth; stir to dissolve. Set tomato-infused broth aside. (Keep remaining broth hot.) 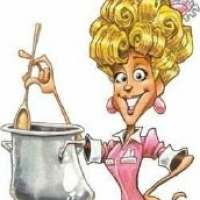 In another saucepan, bring milk to a simmer over medium heat. Add cloves, remove from heat, and let steep, covered, for 1 hour. Remove cloves; set milk aside. Meanwhile, heat olive oil and butter in a large heavy-bottomed pot over medium-low heat. Add pancetta; cook, stirring occasionally, until its fat has rendered, about 6 minutes. Add carrots, celery, and onions and cook, stirring occasionally, until soft and caramelized, 30–35 minutes. Stir in beef and pork; cook, stirring and breaking meat apart with a wooden spoon, until browned, 10–15 minutes. Season with salt and pepper. Increase heat to medium-high, add wine, and cook, stirring constantly, until wine is evaporated, about 6 minutes. Lower heat to medium, stir in nutmeg and reserved tomato-infused broth and cook, stirring occasionally, until liquid is absorbed, about 5 minutes. Lower heat to medium-low, add 1⁄2 cup reserved hot broth, and cook, stirring occasionally, until liquid is absorbed. Repeat, 1⁄2 cup at a time, until all the broth has been used (this should take about 1 1⁄2 hours). Add chicken livers to sauce; cook for 8 minutes. Using a fork, remove and mash livers with a tablespoon or two of the milk. Return livers to sauce along with remaining milk; simmer until thick and velvety, 15–20 minutes. Season with salt and pepper. 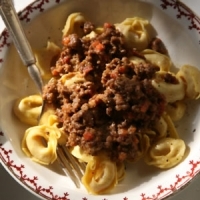 Toss with tortellini or the pasta of your choice, or use in lasagne. Serve with grated parmigiano-reggiano.